Five top lessons learned from making the jump into life as an entrepreneur. It’s been 12 months. 365 days. 8,760 hours and 525,600 minutes as a gal 100% on my own in the business world. One year ago today I left the comfort, albeit crazy, agency lifestyle to pursue my dream. For as long as I can remember, I wanted to work for myself and “live the dream”. 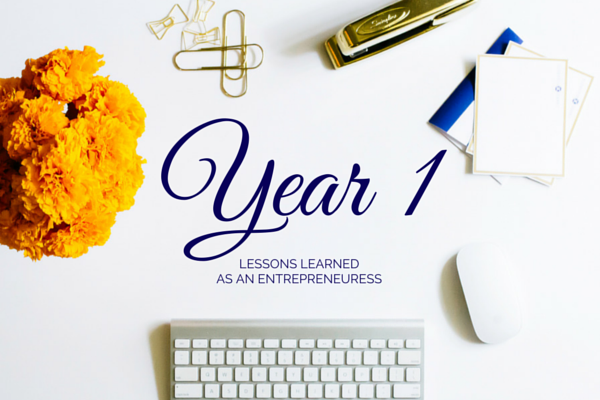 365 days later, I’d like to share with you some of these reflections of life lessons learned as a solo entrepreneuress in the social media age. 1. Running a business is hard work. Although I had technically started Carrie Elizabeth Consulting in January of 2011, it had always been a passion project, or a project that I would invest in only when/if I had time and energy to commit to clients outside of my busy in-house agency commitments. A year ago, the passion was full-force and the projects piled up. A lot of the “behind the scenes” work to launch a business is time consuming and somewhat monotonous to a more creative-spirit like myself. Tax forms, filings, government paperwork, website coding, website crashes – all items entrepreneurs do NOT dream of. Yet, they are absolutely necessary, and truly helped me grow. I have a newfound respect for the larger businesses who have multiple people helping to run the company. As a solo business owner, it’s just me. At any given time you can find me wearing a range of hats, including: client-facing Boss Lady, Accountant, Website Designer, Charitable Enthusiast, Customer Service Representative and IT Extraordinaire. No amount of college courses or work experience could have prepared me fully for the jump into running a business. It was hard. It was challenging, and I found myself questioning whether or not I have what it takes to succeed. Each day is a new adventure and now that I am out of the initial learning curve for a start up, I am acutely aware that life, and business, is good, and I couldn’t be more fulfilled on both fronts. 2. My business and I are synonymous. An interesting shift happens when you are a business owner. You become your business, and your business becomes you. They are synonymous with one another whether you like it or not, and in all situations it can be a tough dynamic to balance both business and life. Because of the blend, it is incredibly easy to take business personally, when business should just be business. I have often times been wrapped up in the politics of business and have let them hinder my spirit or take personally day-to-day business decisions. It’s hard not to, and I honestly wouldn’t have it any other way. Not only am I exposed to other people’s character more transparently on this side of the business model, but I am also overcome with awareness of my own character and upkeep as I continue down my moral road, where I am able to run my business as I want to. No one else has a say; no one else warrants an opinion. It is exhilarating and terrifying. 3. I can and will be productive while working at home. The first two months of working at home were brutal, and I didn’t know if I would be able to do it. I had nothing but time, which to some is a luxury but for a jam-packed-schedule-no-“me”-time kinda gal, it was more like a nightmare. It took me months to unwind my brain and to teach myself that nonstop meetings does not equal efficiency or quality of work, but instead, hinders both. I had to be patient with myself as I learned what it meant to practice self-starter traits and habits so I could find my new, comfortable routine. And for the most part, I love working from home. I love my flexible schedule and how each day is completely different from the next. I love the quiet and ability to run errands and get things done on my own timing as opposed to lunch breaks or pre- or post-work. To avoid the lazy tendency to stay in my workout clothes all day and not get ready for the day, I have practiced one very opinionated motto when it comes to working from home: I WILL be showered (and be wearing makeup) by the time my husband comes home each evening. Other than that, I get to make my own rules as my day-to-day routine is concerned and I have to say, Boss Lady is super awesome when it comes to work/life balance. I think I’ll keep her around. 4. Support and encouragement are essential. I could write a whole blog post simply on this topic. Whether you have your own business or not, this lesson is the most important in my book and most applicable to any situation. I believe you are only as good as your support system. And man, am I blessed with a system! Many, many prayers and chats with God started this crazy leap and my family and friends have sustained me through thick and thin. I specifically can’t thank my husband enough for supporting and encouraging me throughout this entire journey and for being my rock and in my corner from the beginning. I cannot wait to see what the next couple years have in store for us as a team in this business of life, and life filled with business. 5. There will be heaps of tears, sweat and happiness. . . but it is SO worth it. Being out on your own is, at the same time, the most fulfilling and terrifying of adventures. I have never felt so much ownership and passion for my clients, projects and livelihood. Most of the time I have to pinch myself that this is my reality. Today I celebrate. I celebrate courage, perseverance, dedication, honesty, integrity and hard work. I am so thankful for this life I am blessed to live and thank God every day for the position I am fortunate enough to be in. Today I hope to encourage you to follow your dream. Start making a plan today – don’t wait. Believe in yourself and look forward to the time where you will be celebrating you, celebrating life. I love this! Hahah my name is Carrie Elizabeth too! © 2017 Carrie Elizabeth Inc.